The World’s oldest and largest international honour society for dentists has chosen Ardnet Online to build their new website at www.icd.org. The International College of Dentists was founded in 1928 and now has 12,000 members in 122 countries who have been awarded the prestigious title of fellow in the ICD. Fellowship of the college is extended by invite only, a nominated dentist must pass a rigorous, peer review process leading to recognition of the individual’s outstanding professional achievement, meritorious services and dedication to the continued progress of dentistry for the benefit of humankind. 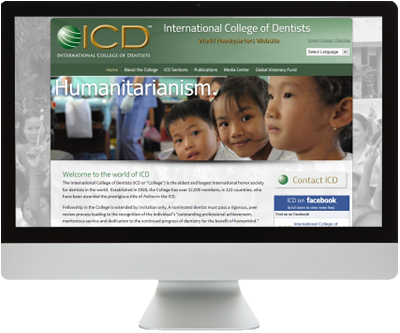 We’ve been helping the International College of Dentists to run their global website for a number of years now so when they selected us to produce a new website we were highly honoured to work in association with such a highly respected professional and humanitarian organisation. Our brief was to make the website look as simple as possible while including elements of interactivity and simple animations and transition effects to give the assurance that the College is a forward thinking and dynamic organisation. Integration with social media coupled with on-page translation into all of the World’s most popular languages opens the page to a global audience and helps promote the International College of Dentists activities on a daily basis. We look forward to providing help and support to the college for many years to come.